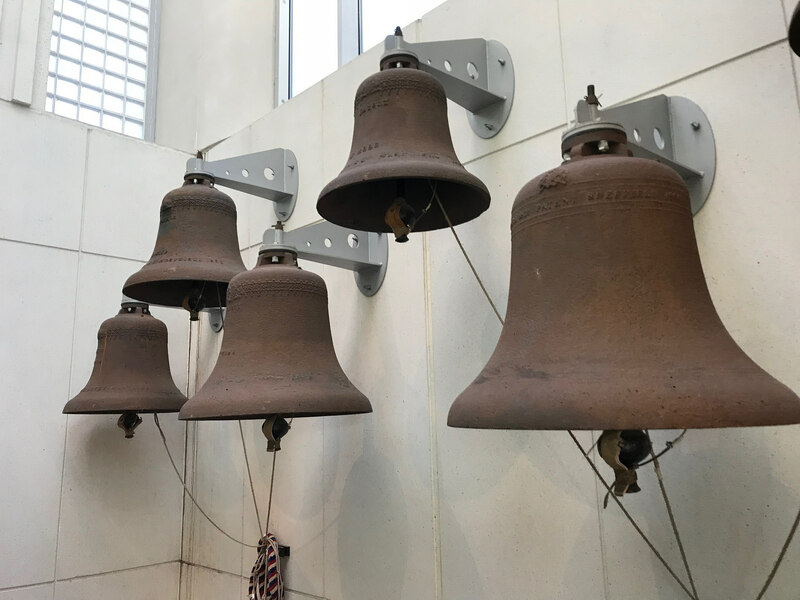 The phrase “ring the changes” seems apt to me: it comes from the English tradition of ringing church bells in carefully calculated sequences or “changes,” each one including the full range of available bells in a varying pattern. See how the pattern changes the placement of bell number two? He is the bread that came down from heaven. This bread is his body. Everyone needs to eat this bread. The ideas stay the same but the arrangement keeps changing. Unlike the tradition of ringing the changes on bells, however, in John 6:51-58 Jesus actually keeps sneaking new elements into the sequence. Those additions are the promises Jesus is making about the Bread of Heaven. And if you are influenced by such teachers as Luther and Calvin, you know that you should pay careful attention to Christ’s promises. Saving faith in Jesus amounts to trusting him — trusting that the promises he gives are true. In John 6:51-58 the promises fall into three groups. In this particular passage the framing promise is eternal life. Because of this framing it seems to be the main promise — but the frame is artificial. This is not really a passage unto itself, with that promise at the beginning at the end. John 6:51-58 is the lectionary’s nearly random slice of a too-long-for-one-Sunday-morning story. It also sounds central because of the cultural weight of the afterlife in American Christianity. Whether it is your personal issue or not, as a culture we are almost obsessed with the question of whether we are going to heaven or hell, to eternal life or to damnation. Whole evangelistic campaigns, whole denominations, rest on that question. So we are prone to read this passage and glom onto that promise about everlasting life and let it sort of wash into what we see elsewhere in the passage. If that’s all we see, it’s probably all we will preach. But if everlasting life is all we preach, we are going to see a lot of eyes glaze over. That’s because for a lot of people the question feels irrelevant. Don’t believe me? Ask around. Ask some non-Christians. Tell them you aren’t going to try to pressure them into anything — you just want to know how important living forever is in their personal viewpoint. Let me know the results. Neither the threat of damnation nor the promise of everlasting life are getting a lot of traction in evangelism these days. Don’t get me wrong — it is an important enough question. There’s a lot of biblical material to explore on it. But I think it is worth noting that the offer of everlasting life is not the only thing Jesus is talking about here — or elsewhere. That promise is not about life after death. That’s about life right now. Jesus is working with the idea that you and I can be technically alive while somehow walking around without any “life” in us. What kind of being goes wandering around the neighborhood without any actual “life” inside? The “undead.” They are a multi-million dollar industry in Hollywood, and have been for years. Zombies, people with no actual life in them, are among our primal fears. We don’t want to meet them. And honestly, when it comes to primal fears, meeting them isn’t the real problem. We don’t want to BE them. We are afraid, deep down inside, that maybe we ARE them. So take it one step further: What is being symbolized in all these Zombie shows? What do I fear becoming, if I fear being alive with no actual life in me? I fear that my existence is meaningless. I fear that my daily life is more like a walking death. If this is a fear that dominates popular media, then Jesus’ promise has a place to land. It comes into sharpest relief for people with addictions: they eventually hit bottom, realize that something deadly has taken over and they are out of control. They need life inside. But it is also there waiting to be seen for those of us with ordinary middle class problems. Like our obsession with our Facebook newsfeed. We look with pleasure or outrage at the latest comments on the latest news, or we look with envy at someone who’s life seems to be so glorious — and afterward we feel dead inside. I’ll tell you, since I left my faculty position, I get far fewer emails — but I check my accounts many times a day. I go looking for the tiny emotional hit of seeing a message from someone I know, some opportunity, some offer — and afterward I feel dead inside. Jesus offers, instead, that with him we will have life inside. Without him? Not so much. I want that Bread of Life. I want to have life inside me. 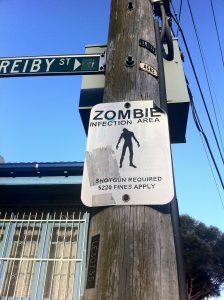 Who wants to be a zombie? This second promise, of life within us instead of death, should prompt us to ask how to get it. That, I think, is what we find in the third promise. He’s foreshadowing two things here. First, he foreshadows John 15, where he says a lot more about “abiding” with him as “branches” in the “Vine.” But here, just in passing, he makes “abiding” the consequence of his being Bread of Life. We eat the bread — and then we are physically united to the bread. The second thing he foreshadows is the Last Supper, where he gives us the Eucharist, the Bread and Wine which he says are his Body and Blood. By physically eating and drinking them, we are spiritually united to him. Eat this Bread of Life, be united to Jesus, and then you really will have his life within you. That promise deserves a world of attention. Rather there are a thousand decisions a day to choose the Bread of Life. I need to choose Jesus instead of the internet, or whatever else obsesses. There are individual processes to nurture, like a rich and active prayer life where I feed by faith on Jesus as Bread. There are corporate process too, like an active life in the Church where I can receive his Body and Blood in the Eucharist. I’d love to send my Monday Meditations, as well as my other new articles and announcements, straight to your inbox. Just scroll down to the black box with the orange button to subscribe to my weekly(ish) newsletter. I’m planning to put together a new class on prayer this fall — a great way to renew your prayer life in a season we all think of as a time of fresh starts. Watch my blog for news (or subscribe and you’ll hear by email. Sorry your comment was stuck awaiting approval for a couple days. We were out of town. Hope you are doing well and I so appreciate your affirming words.